Our company is capable of delivering consignments on time owing to an efficient trading network we have. Being a Supplier of jewelery tags, we continue in the same vein and keep enchanting our customers with our spotless quality. Used by jewellers worldwide to label jewellery. Use:-Necklace set with Bracelet packaging. - The Jewelery Tag is frequency independent tag and has a smooth surface for convenient labeling of price, material, style or other information. - Very small and attractive in size & shape with multi read/write capability. - Flexible Read/Write Range (reader dependent). - Insensitive to almost all non metallic materials. - Available in many sizes. 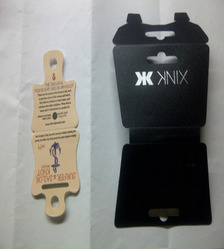 - Jewelry Tags in attractive colors and shapes. 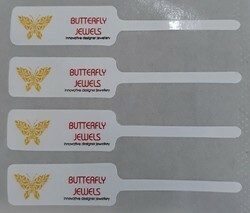 - Barbell, Rat Tail, Dumbbell, Butterfly, Bat Shaped Jewelry Tags can be supplied. - Available in roll form.